MIT certainly isn't a place for everyone. This is especially true for architect super star Frank Gehry. World-renown architect, Frank Gehry is known for his often unexpected organic shapes, radical angle applications and unconventional materials usage. Based in Los Angeles, California, he is a Pritzker Prize winning architect (architecture's Nobel Prize). His most notable buildings are tourist attractions. Scores of museums, companies, and cities seek Gehry's services as a badge of distinction, a brand of contemporary quality. He considers his architecture sculpture. MIT had to have its Gehry building, and it got it. His best known and most distinctive works include the titanium-covered Guggenheim Museum in Bilbao, Spain, Walt Disney Concert Hall in downtown Los Angeles, Dancing House in Prague, Czech Republic, as well as his own private residence in Santa Monica, California. This personal house actually put him on the architectural map. Once recognized as being strongly innovative, it changed his professional status from a "paper architect" to an architect who actually built projects. This is a phenomenon that many prominent architects suffered before receiving their first major commission in later years. Gehry and the building contractor, New Jersey-based (but formally Boston based Skanska-Beacon Construction) Skanska USA Building Inc. are being sued by the Massachusetts Institute of Technology. The suit charges negligence resulting in major flaws in the design and construction for a major campus teaching and research facility, the overly locally well reviewed and unquestionably celebrated Ray and Maria Stata Center. The building is strategically located on Vassar Street in Cambridge. 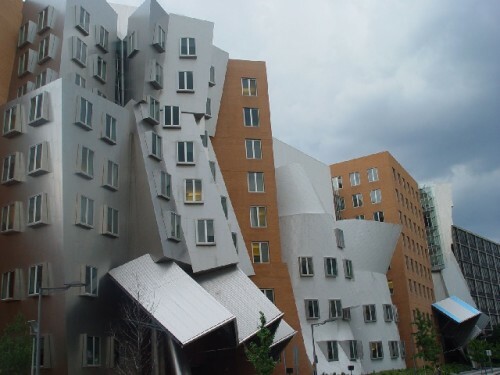 Citing leaks, cracks in masonry, mold growing and drainage backing up, the lawsuit states that MIT was suing Gehry and the contractor for breaching its duties and providing deficient design services and drawings as well as construction failures. Clearly the great technical school is rather angry. On top of the other problems, including snow and ice falling dangerously, blocking emergencies and damaging the faÃ§ade and details of the building, MIT had to hire another firm for $1.5 million in fees to correct problems to the outdoor amphitheatre. By the way, Gehry Partners received $15 million in fees. The whole project cost $300 million. So the contractor, Skanska USA, was rewarded more than handsomely as well. Of course as contractors most often do, Skanska is blaming the architect for all the problems. They claim that an outside consulting group found design flaws prior to the construction of the amphitheatre, and Gehry ignored them. Skanska says that it spent hundreds of thousands of dollars trying to fix the amphitheatre's structural problems, but MIT was ultimately unsatisfied. As he explained in an interview with Harvard Design Magazine, Gehry has a particular, even eccentric, three-step approach to his projects. He attempts to instill what he calls the "organization of the artist" during construction. He considers this a method to prevent political and business interests from interfering too much with design. Therefore, the resulting outcome is as close as possible to the original design drawings. Secondly, he attempts to ensure he has a detailed as well as realistic cost estimates before proceeding with building construction. Thirdly, he attempts to maintain a close relationship with area builders to ensure projected costs are met. Apparently only the first step was met at MIT's Stata Center. His other two points seemed to have somehow evaporated during the design and construction process. Technical problems are not supposed to happen with Gehry's projects. His firm owns as well as adapts and employs CATIA, a modeling and analysis software designed for the aerospace and auto industries originally developed by Dassault Systems of France. This software program is suppose to streamline not only the engineering aspects of architecture, but also project management in order to reduce the costs associated with traditional project organizational approaches. It is also suppose to enable the architect to create previously physically unconceivable structures. Whoops, something went wrong! In other words, somewhere from Gehry's rough concept sketches to the engineering drawings to the construction, something was left out of the equation. Can we blame the software? This is nothing new for architecture and great/famous architects. Frank Lloyd Wright was notorious for not listening to engineers. His buildings often leaked. Falling Water, arguably his greatest work, needed extensive re-engineering in the last decade or so due to engineering flaws and deterioration. Wright prided himself on telling clients to put enough buckets under the leaks. I.M. Pei and Partners certainly had a lot of pain in the neck over the falling window pane problem at the John Hancock Tower. Because of all the boarded up windows, the building was often referred to as the "Plywood Palace." This was an example of fenestration without proper representation. Hubris, thy name is famous architect. Anyway, now there is a little piling on. The Boston Globe critic for life, Robert Campbell is now backpedaling from his earlier rather effusive compliments about the Stata Center. He was recently quoted in a Globe article that there was some sort of give and take between non-conventional architectural materials and shapes and the unknown consequences or something to that effect. Right, Bob. Even John Silbur, the long time erasable President of Boston University has jumped in to the fray. Apparently, Silbur's father was an architect, and he has recently written a book on architectural problems. He feels that Gehry viewed his building as a sculpture, but people don't live or work in sculpture. Campbell is right; Silbur is right. Criticism of Gehry's body of work is plentiful. This includes everything from the buildings' waste of structural resources by creating functionless forms to the buildings are apparently designed without researching local climates to the spectacle of a building often overwhelming its intended use to the buildings do not seem to belong in their surroundings. This is underscored by Gehry's apparent lack of concern for pedestrians, urban design issues and even color choices. Personally, I have always felt that the Stata Center was Gehry Lite, not one of his great buildings. It feels more than somewhat derivative of his previous work. It is fun to look at from the outside, yet the insides seem to be rather confused and somewhat cheaply finished. There are rough plywood tables, retro-60's wall graphics and long twisting corridors that are suppose to aid in cross discipline scientific and technological interaction. Rarely can an architect change the way people normally act and interact due to the arrangement of a building's walls, rooms, offices and corridors. Gehry does not do it here, either. However, to be fair, everyone working in the building does not dislike it. Now, what to do? Architects and engineers have Errors and Omissions insurance. Major contractors are heavily bonded. So, insurance will probably pay for much of the solution. The case will probably be settled out of court. Lurking in the shadows here is the Arlen Spector (the senator that seems to be involved in almost everything in one way or another from the Kennedy assassination to the Nixon resignation to current day investigations) of the architecture and design world, William J. Mitchell. Mitchell is an academic architectural futurist who has written many books. Over the years, he has served as a technical consultant to the Gehry firm. Having taught at a variety of universities, he was formerly the Dean of the MIT School of Architecture and Planning and is currently the Director of the prestigous MIT Media Lab. He also served as campus architectural advisor to the then president of MIT, Charles Vest, during the planning and construction of the Stata Center. Vest stepped down rather suddenly after thirteen very successful years as president. Some say that it was due to personal reasons. My view (argued against by MIT staff and loyalists) is that the Stata Center's costs jumped from $140 million to nearly $300 million under his watch, and he felt that it was time to go. This is big bucks even by Harvard and MIT standards. As he is strategically silent and keeping his head down, I wonder what William Mitchell is actually thinking now? The Stata Center is a big project involving big money at a big school that has ended in big problems. It was a just a matter of time before something happened. It will be a matter of more time and more money to fix. Simplistic Moral: architecture is not simply big sculpture despite what some prominent architects think.